This tall and robust plant grows to a height of 20 to 70 cm. Instead of foliage leaves it has several sheathing leaves enclosing the stem. 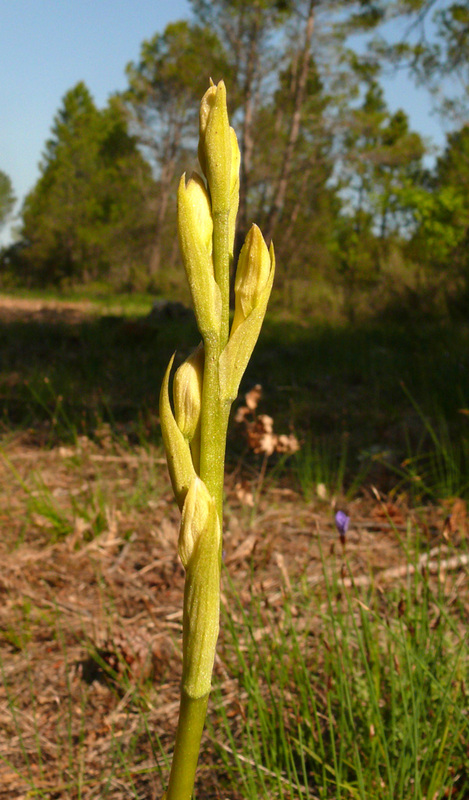 The elongated inflorescence has 4 to 25 large flowers with long and acuminate bracts. The lateral sepals as well as the petals are spreading horizontally, the dorsal sepal is bent forward. 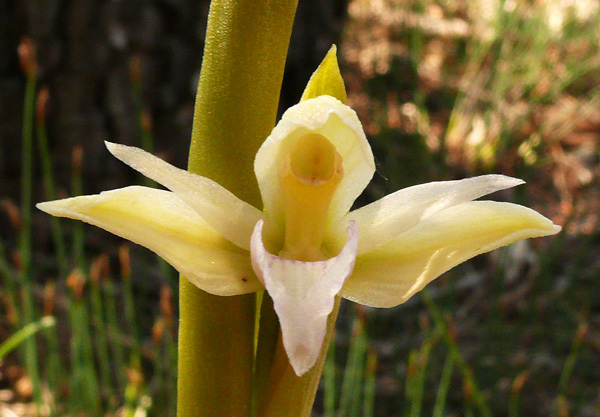 The labellum has two parts – the hypochile and the prominent epichile with upwards curved edges. The spur is about as long as the ovary and bent downwards. 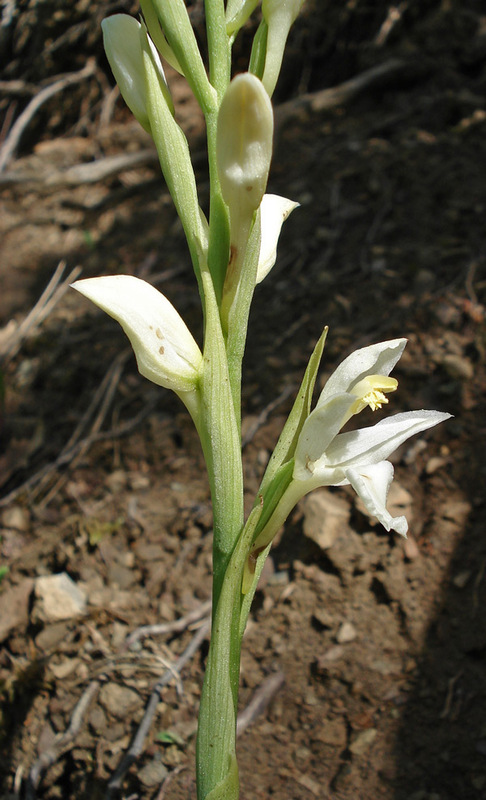 Linné described the plant as Orchis abortiva in his opus Species plantarum (1753). The present name goes back to the Swedish botanist Olof Peter Swartz (1760-1818) and his contribution in Nova Acta Regiae Societatis Scientarum Upsaliensis in 1799. The variebility of this species is mostly restricted to red (var. rubrum) or deeply violet flowers. 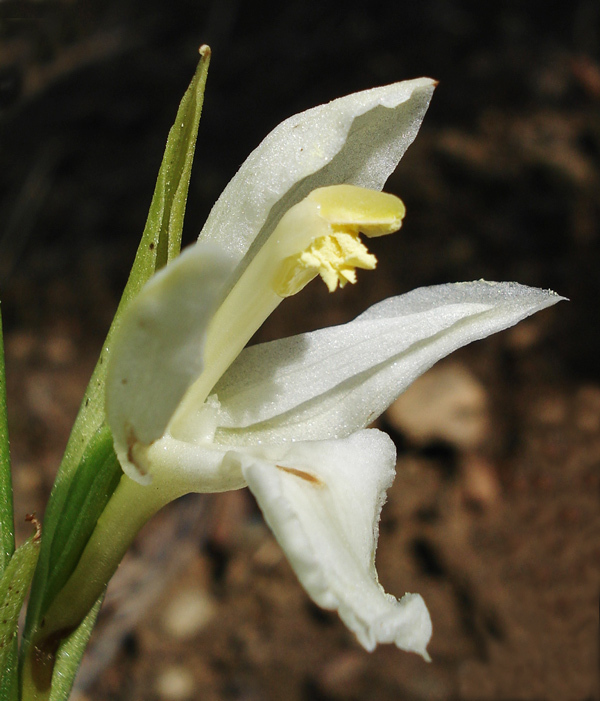 The albiflora form seems to be extremely rare. The absence of anthocyanins in the flower as well as in the stem and leaves has the effect that the leaves are quite green – in contrast to the violet colour of the regular form. In contrast to common assumptions Limodorum abortivum is equipped with chlorophyll. With the violet flowering plants it was stated that the photosynthesis is insufficient, making the plant dependent on the existence of fungi of the genus Russula (M. Girlanda, M. A. Selosse, D. Cafasso, F. Brilli, S. Delfine, R. Fabbian, S. Ghignone, P. Pinelli, R. Segreto, F. Loreto, S. Cozzolino and S. Perotto: Inefficient photosynthesis in the Mediterranean orchid Limodorum abortivum is mirrored by specific association to ectomycorrhizal Russulaceae. In: Molecular Ecology 15, 2006). Limodorum abortivum is growing in coniferous woods, up to 2300 m. Bloom is from April to July. The plant is distributed in Central Europe and the Mediterranean.